The Olive-throated Conure prefers to fly swiftly in groups of up to 30 birds, in tight formation twisting and turning through the treetops like shoals of feathered fish. 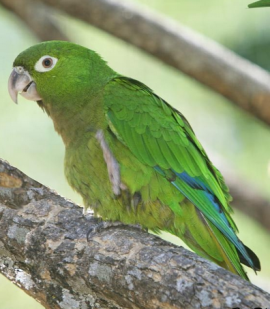 Both adults-green with a bright green rump; cheeks and ear coverts bright green; throat and breast olive/brown. Bill horn coloured with pale grey at base. Bare eye ring white in colour; eye orange. As in adults but with brown eyes. Described as noisy and screechy in flight. Also high-pitched notes; sustained harsh twittering sounds with upward inflection. Also piercing chirps. ML Media Catalogue 204522 Olive-throated Parakeet Eupsittula nana, Proctor, C. Justin, Trelawny, Jamaica, Feb. 11 2015, Cornell Lab of Ornithology. Aviary or suspended cage, minimum length 2 or 3m (6.5 or 9.8 ft). Fruit such as: apple, pear, orange, cactus fruits, pomegranate, etc, forming about 30 percent of the diet; vegetables such as: carrot, celery, green peas and beans, corn; green leaves such as: Swiss chard, lettuce, sowthistle, dandelion, chickweed, etc; spray millet; mix small seeds: canary, millet, and smaller amounts of oats, buckwheat, safflower; soaked and sprouted sunflower seed; cooked beans or pulses, and complete kibble. Chew items such as bird safe wood (fir, pine, willow or elder) or vegetable tanned leather toys; also enjoys bathing, so provide overhead misters or shallow water bowls. Large flight for groups. Diagonal nest box 8" x 12" x 10" (20.3cm x 30.5cm x 25.4cm). Threatened by unsustainable exploitation for the pet trade. Seen in wooded hills, mountain slopes, scrub, cultivation and gardens in humid or semi-arid areas from sea-level to mid-elevation forest. Prefers figs and fruits, also unripe tamarind pods. Will utilize cultivated crops. Large groups congregate after breeding or where food is abundant. Will mix with other species. Tree hollows used for nesting. 4 or 5 rounded eggs, 26.5 x 22.0mm (1 x 0.8 in).